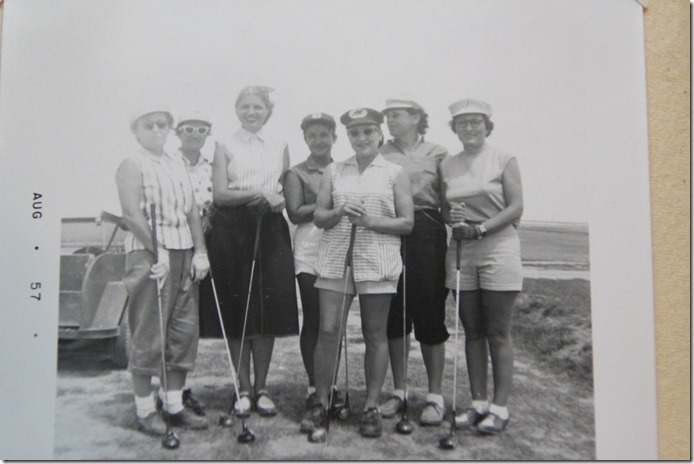 Well, women in West Texas are a hardy bunch, having dealt with Mother Nature and Human Nature before, and this bunch wasn’t about to settle for any dinky little three-hole golf course. 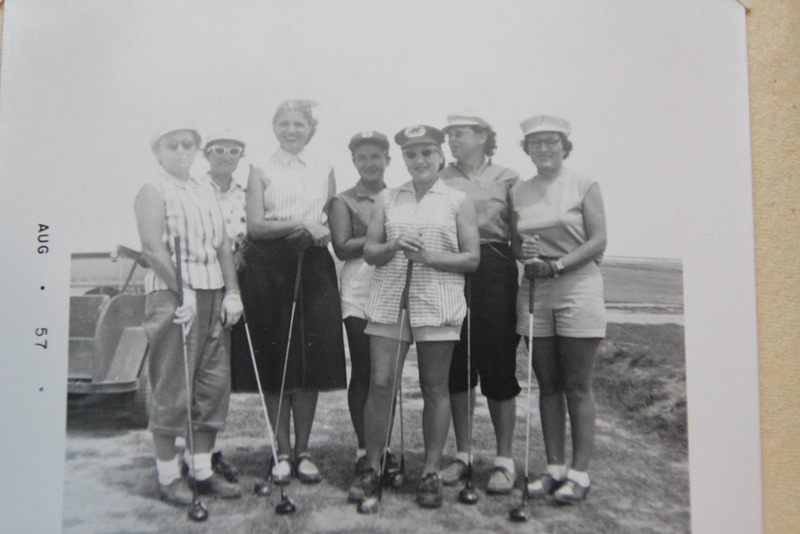 Ruby Hart, Mary Frances Holt, Naomi St. Clair, Marie White, and I’m sure others came up with the idea of a women’s group to stake their claim on the new course. (And if you know of a name that needs to be added to this list, feel free to let me know and I will add it.) 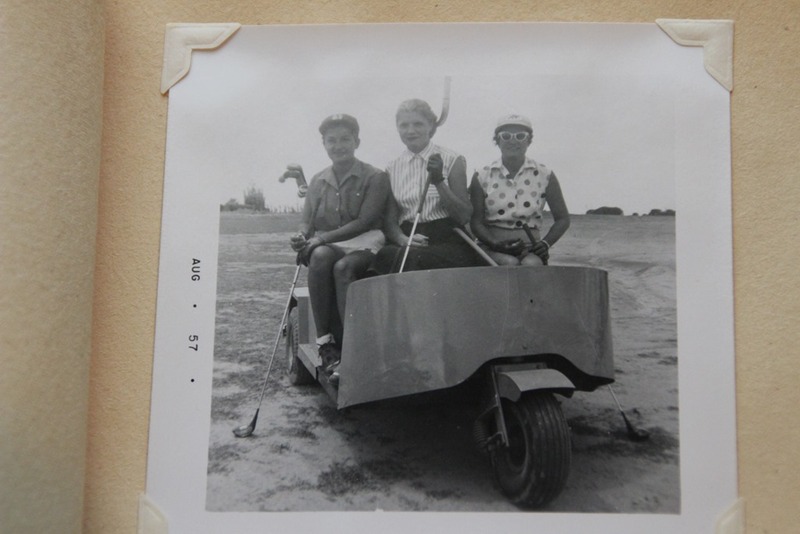 So somewhere between 1954 and 1956, the Muleshoe Ladies Golf Association was established and has been a viable and vibrant presence at the golf course ever since. 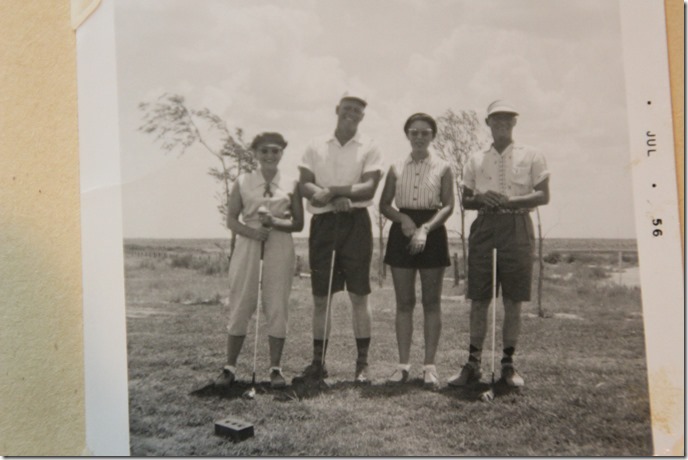 Just like when I researched my story about the beginning of the golf course in Muleshoe, (“Golf, Anyone?” December 7, 2017), the majority of the principal players have passed away and some who are still with us can no longer remember specific dates and names needed for a definitive chronology. So I have tried to connect the dots based on information that has been remembered and shared with me and what I found in some very old scrapbooks and newspaper clippings Jeanetta Precure dug out of the ladies’ locker room and let me take home to study. And this is what I have pieced together. To begin with, those same women who weren’t always welcomed to play on the course pitched right in and helped plant all those trees that went on to make the Muleshoe course quite distinctive in the High Plains, and, it turns out, challenging as the trees grew. 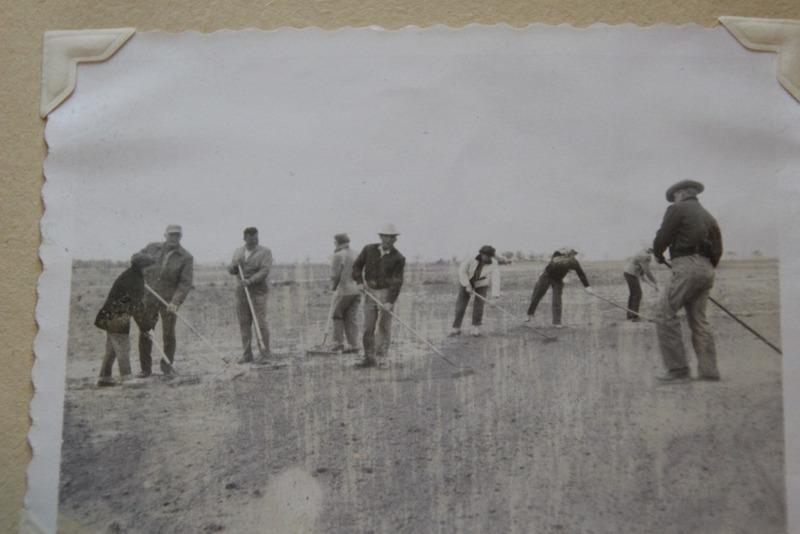 This first photograph in one of the scrapbooks, undated and with no one identified, shows men and women golfers working on the flat, barren ground perhaps preparing it for the trees to be planted soon or maybe smoothing the sand greens everyone does remember playing on. The photograph below is dated July 1956, and while the background is still open and empty, at least a couple of trees have been added. But based on some images that follow from 1957 combined with comments from the older generation players I talked to, the tree-planting went on for several years and probably wasn’t completed until the mid to late ‘60s.The men probably did the majority of the digging, but the women did their part to help make the course pretty and inviting. After all, they were going to play on that course, too, remember! Right off the bat, the ladies association was busy. The scrapbook Jeanetta shared with me must have been the first one they tried to keep because it was filled with very early undated newspaper clippings with results of tournaments, election of officers, monthly meetings, and more old photographs no one thought to write captions for. 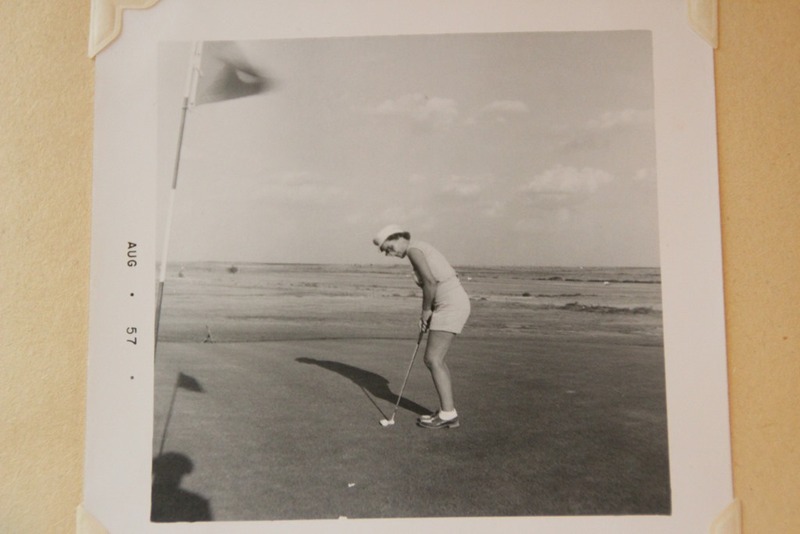 Someone had added May-1956 to the bottom of the first clipping, however, which told of the West Texas-New Mexico Women’s Golf Association’s meeting to elect officers and hold their first “play day” since they had organized. These Muleshoe women were in attendance: Jo Wood, Melzine Elliott, Mary Frances Holt, Ruby Hart, Janet Wagnon. Nona Blake Douglass, Tiny Forbes, Edith Evans, Mildred Lambert, Lydia Lopez, Marie White, Eunice Evans, Ruth Malone, and Lois Lenau. Recognize any names? 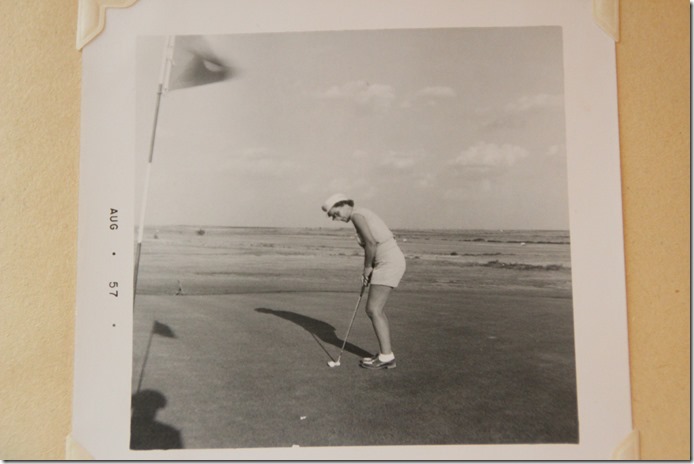 More clippings followed about events in Muleshoe and the other towns with ladies’ golf associations who were members of this West Texas-New Mexico Women’s Golf Association, now known as the Hi Plains Ladies Golf Association. Other photos of players on flat, bare pasture land in three-wheeled golf carts, dated August ‘57, look like ancient history compared to what the course looks like now. Later in the book I did find this photo from a tournament in the ‘60s marked Cookie [Bamert] and Punk [Bragg]. And look-you can actually see more trees in the background! Which brings us to today. As with any group, membership waxes and wanes, but the association now has 24 active members, plus Laverne Winn and the late Analita Haley who were honored with lifetime memberships. Analita’s name popped up frequently in later clippings in the old scrapbook.Through the years the membership may have changed, but the dedication to the club has never wavered. Jana St. Clair is this year’s president, Kim Hunt is the vice-president, Linda Erdmann serves as secretary, Tammy Black is the treasurer and tournament chairman, Kay Field is publicity chairman, Treena Matthews is the Hi Plains director, Ashley Pool is the play day chairman, and not pictured, the card chairman, Jerie Flowers. What? Wait-card chairman? Yes, Shanghai to be specific. And a card game called Golf when the golfers can’t get on the course due to weather or whatever. This may be a ladies golf association, but you don’t have to play golf to be a member. The third Wednesday of each month, January through October, is the play day, which is a busy day. Deborah Noble, who is in charge of decorations and food for the day, said she figured that back when it all started Wednesday was probably chosen as meeting day because women would have come into town anyway for double stamp day at the Green Stamp store – and if you don’t know about green stamps, you are just too darn young! 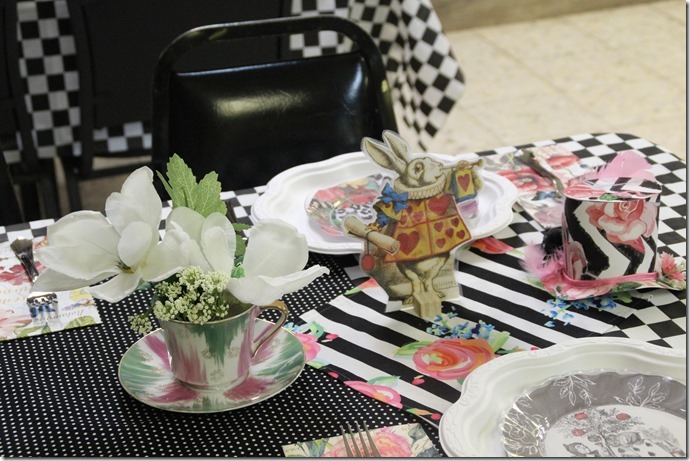 Members volunteer each month and let Deborah know they are good for the decorations and food for that meeting. The golfers play in the morning and/or afternoon depending on the weather that day. 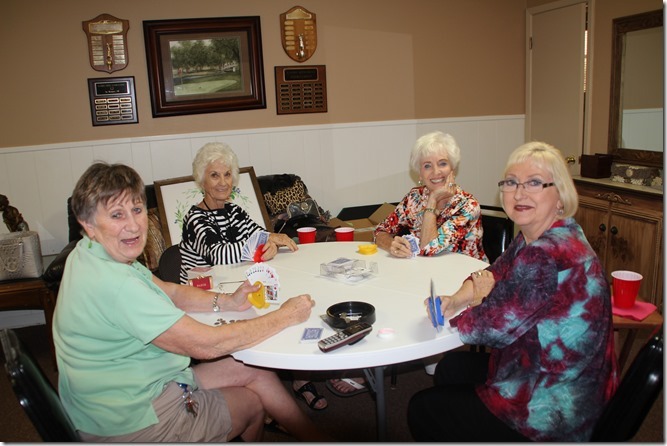 Then all members enjoy a meal, have a business meeting, and after that, the card players gather at the tables in the women’s locker room for an afternoon of what I hear is a pretty competitive game of Shanghai. 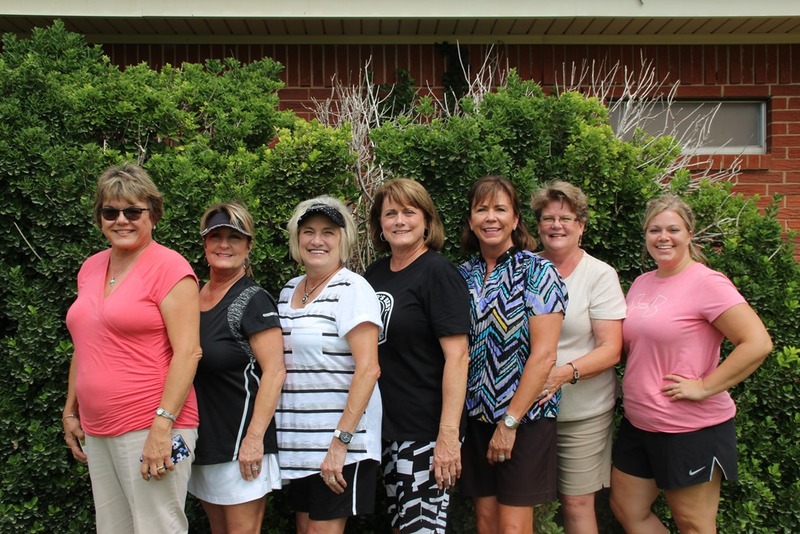 The second Wednesday of the month players can travel to play days at some of the other associations in the Hi Plains Ladies Golf Association to play. Points are earned at these play days for the months of April through October and are tallied up at the end of the season in October with prizes awarded to those with the highest points. The other associations in the Hi Plains Association are Tulia, Clovis, Portales, Farwell, Dimmitt, Canyon Palo Duro Creek, Canon Country Club, and Hereford. 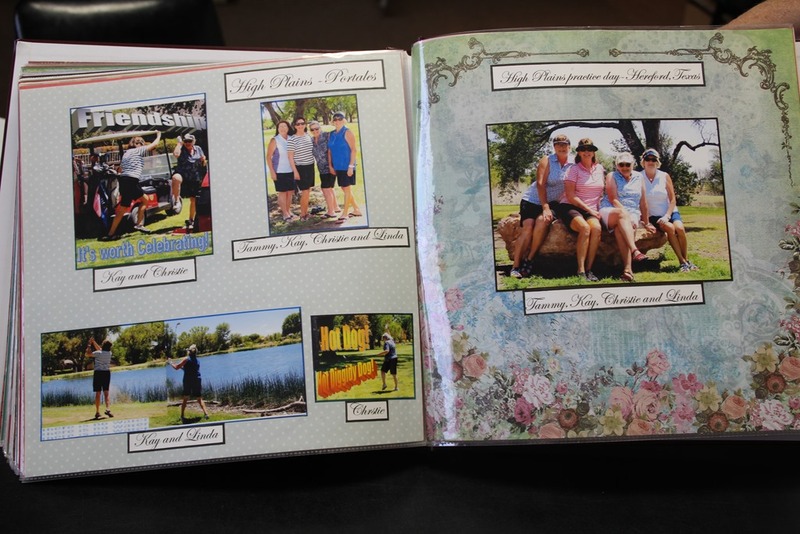 The big event of the year for the Muleshoe association was held this past Saturday, August 18, the Jennyslipper Two Lady Scramble, rumored to be the most popular and well-attended tournament of the Hi Plains group. Tammy Black, tournament chairman, knocks herself out with decorations and ideas to make the tournament the best of the year. 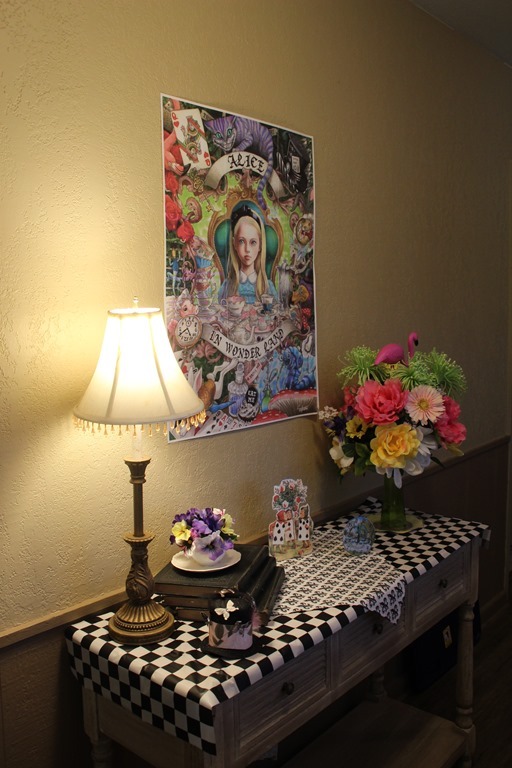 Members rise to the occasion and help Tammy transform the club house into another dimension. 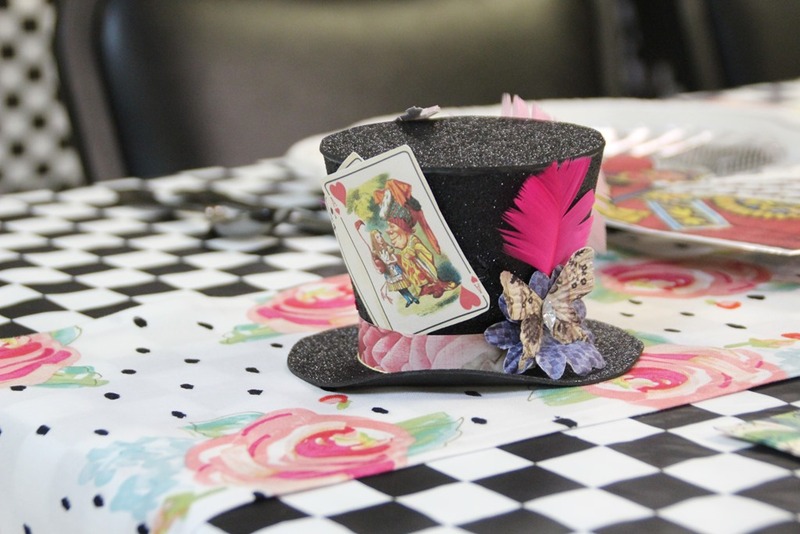 This year’s theme was Alice in Wonderland with appropriate ornamentation. Thirty teams of two women each signed up to enjoy the day. Breakfast and lunch were provided and everyone received a goody bag. After all golfers finished and the lunch was enjoyed, door prizes donated by members and local businesses were drawn for, and then winning raffle tickets purchased by players were drawn to win other prizes also donated by members and local businesses. Prize money was awarded to winners in five flights as well as just-for-fun contests, like longest putt, closest to the hole, and longest drives for five age divisions. Tammy says each year women ask to sign up for next year’s tournament at the end of the day, but they have to wait until the fliers go out next year so everyone has a fair chance to enter before the limit of thirty teams is reached. 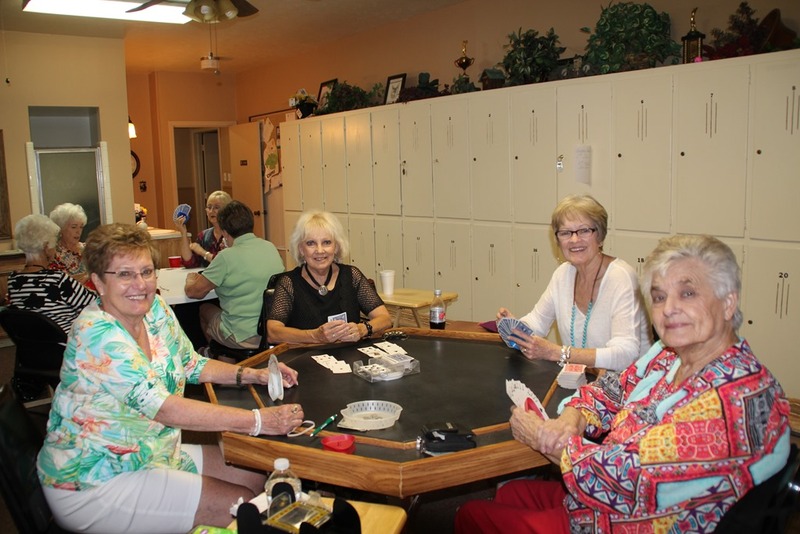 The association has a members-only tournament, the Naomi and Marie Memorial, in honor of Naomi St. Clair and Marie White. The name has been changed to the Ladies Memorial Tournament and used to be held in May, but now is always looked forward to in September. 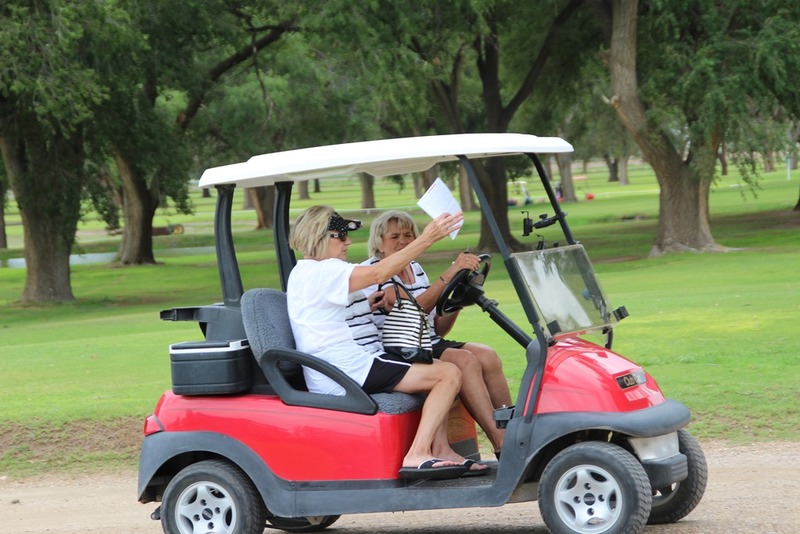 The Muleshoe association is also a member of the Western Lone Star Senior Ladies Golf Association and Muleshoe golfers over the age of 50 are eligible to play in that association’s tournament, which was held in Muleshoe in 2003. 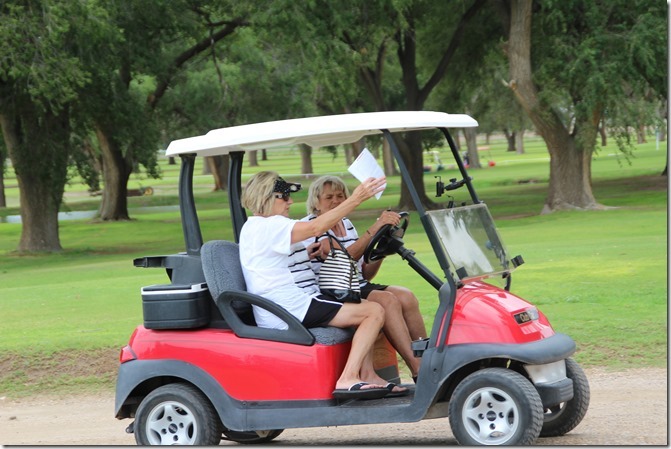 Muleshoe is also a member of the Women’s West Texas Golf Association and are eligible to play in that association’s events. 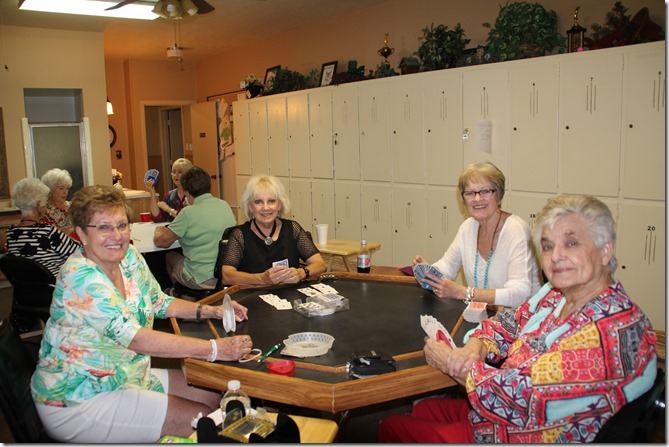 But just like the card playing doesn’t require a golf ball, the group enjoys other activities not related to golf, but very much related to friends and involvement in the community. Members enjoy an end-of-year dinner in October, celebrate at Christmas with a party, and donate money to various causes and/or individuals when the need arises. They have given money to buy toys and clothing at Christmas and support the Bailey County Ministerial Alliance.They give back to the club as well, supplying money and labor to make improvements all can enjoy, such as replacing the ceiling fans and carpet, painting the interior club house walls, paying for a new dining room floor and the painting of the pool area, and are always on the lookout for other things that need to be done. The Muleshoe Ladies Golf Association has been around now for sixty or so years and shows no sign of slowing down. But the next time someone wants to research the more recent history of the group, it will be much easier, thanks to Elinor Yerby, long time member who took it upon herself to keep up with their activities with scrapbooks a bit more complete than the first two I came across. 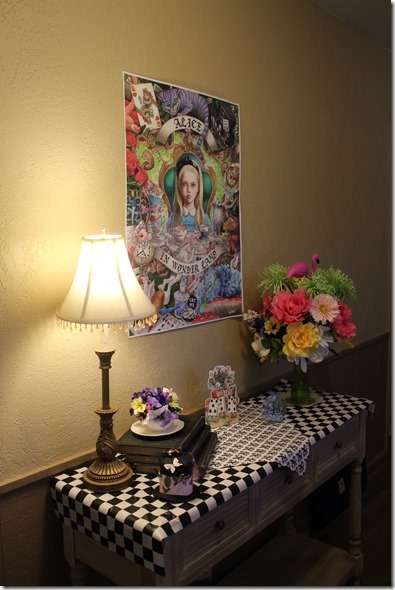 Elinor moved from Muleshoe this year, so the scrapbooks will need a new designer. Tammy said she and the others would try to continue Elinor’s legacy, but those will be hard shoes to fill! 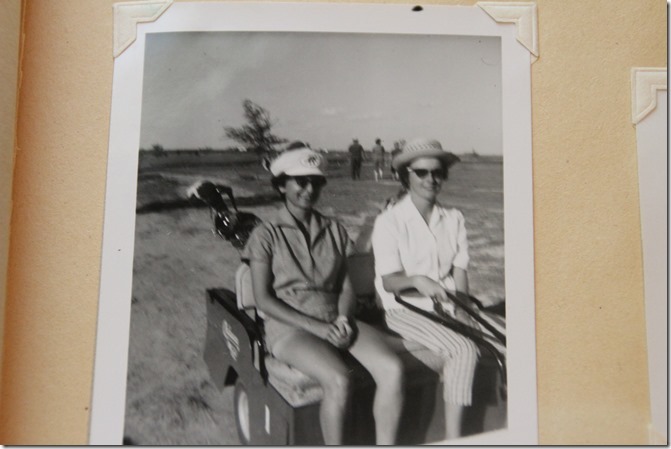 So if you like to play golf or Shanghai or like to eat and visit and have a good time, go to the Muleshoe golf course on the third Wednesday of the month and meet some women who do like to play golf and Shanghai. Eat a meal and visit with them. You might just want to join. Thanks to Jeanetta Precure, Laverne Winn, Jerie Flowers, Tammy Black, Linda Erdmann, Kay Field, Treena Matthews, Deborah Noble, Helen Templeton, and all association members who helped with this story. Love the women. Love the club. Thanks for piecing this all together. Especially enjoyed reading the names of people I remember growing up. Thanks for reading, Nick. Glad you enjoyed it! Copyright 2016 Alice Liles, All Rights Reserved | Website Design By Your Web Pro LLC.